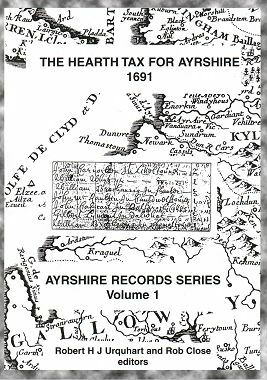 The AYRSHIRE HEARTH TAX ROLLS 1691 is the copyright © of the Ayrshire Federation of Historical Societies. The excerpt presented below, for the Parish of Maybole, is with their kind permission and may not be distributed in any manner without their approval. The full transcription and publication may be purchased by following this link to the book on Amazon.com. Our thanks to Rob Close, editor for his kind assistance and permission to display this excerpt. Althought the rolls should be regarded as having been compiled in 1691 or soon after, many have been amended, usually by the insertion of notes in the margin, or else above or after the entry concerned, often in what looks like a different hand to the one which compiled the original list. There often, but not always, relate to entries where part or all of the tax has been unpaid. In some cases the amendment contradicts the information in the payment columns (e.g. the third payment column might record three hearths surveyed and three hearths paid for, but a marginated note might record "rests 2"). Other corrections are much clearer, e.g. "now in Gaiston" or "poor". The rolls should be regarded, therefore, as working documents, containing information compiled between 1691 and 1694. For most readers this will not be especially important, but where any amendments infer the erection or dereliction of a building, succession to property, or the migration or death of an individual, the reader should refer to the original roll in the Scottish Record Office. In Ayrshire the form of the rolls varies between bailliaries and between parishes, which affects their usefulness to the modern reader. CARRICK. The sub-collector, John Hamilton, claims in his deposition to have personally surveyed most of his bailliary by occular inspection (below, p.1), and the way his rolls are compiled suggests that this may have been true to some extent, since Hamilton’s lists .appear to have been compiled settlement by settlement, rather than estate by estate, as in the other two bailliaries. In all cases except one the list is a single one for the entire parish, usually giving both tenants’ names and the names of their fermtouns. Hamilton would certainly have come across many of those named in the rolls in the course of his work as Bailliary Clerk of Carrick.5 All parishes in Carrick have been included, and one parish - Maybole - has been broken down into separate estates, though again most fermtoun names are recorded; the first section in the Maybole list probably represents the town itself, although few trades are recorded. There is no record of either the poor or the deficients. 1. Acts of the Parliament of Scotland. vol ix.. 1689-1695. Edinburgh. 1822. p.236. 2. Acts of the Parliament of Scotland. vol xi.. 1702- 1707. Edinburgh. 1824. p.284. 3. Miscellaneous tax rolls, [E69/2/1-3]. Scottish Record Office (SRO). 4. For a discussion of the historical value of surviving Scottish tax records see Cecil Sinclair. Tracing Scottish Local History: a guide to local history research in the Scottish Record Office. Edinburgh. 1994. 5. Plea Rolls for the Bailliary Court of Carrick survive for the period 1663-1717 (with gaps) partly in the SRO (RH 11/14/2/1-13) and partly in the Ayrshire Archives (ATD 42/7). Transcription of these was begun at the same time as the Hearth Tax rolls, and it is hoped to publish a complete transcript of the surviving records of the Carrick Bailliary Court later in this series.